Could you organise Cuckfield's Poppy Appeal this year? 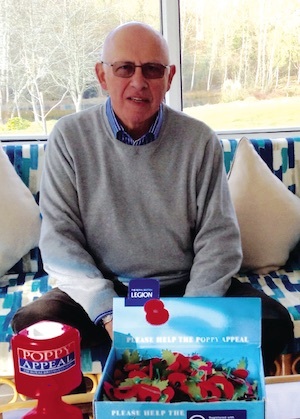 Long-standing Cuckfield resident and Poppy Appeal Organiser Peter Negus has been working as a volunteer supporter of the Royal British Legion (RBL) for over 20 years now. Peter first began making his collections in Copyhold Lane in the late 90s, and 12 years ago he was invited to organise the appeal throughout the village. Not only does Peter’s involvement mean helping to raise funds for the Poppy Appeal but it also includes increasing awareness and promoting the profile of the appeal. 2018 was particularly important for the Poppy Appeal as it marked the Centenary of the Armistice that ended the First World War. The Poppy Appeal in Cuckfield is just a small part of a nationally led campaign which last year alone raised over £50m to enable the Royal British Legion to support former members of the armed forces and their families. The Cuckfield arm of the RBL is quite separate from the Poppy Appeal, although Peter does work closely with the local branch and a number of its members are collectors for the Appeal. The RBL was formed in 1921 in order to support current and former military staff and their families. Whilst surviving servicemen from the First World War are now thin on the ground, there are participants and their families from more recent conflicts, from the Second World War to Iraq and Afghanistan, that rely on the RBL for assistance and support. Sadly, the world continues to be a dangerous place and further conflicts cannot be ruled out; meaning that support from the RBL may well be needed in the future and for many years to come. As Poppy Appeal Organiser for Cuckfield, Peter coordinates 30 house to house collectors together with 70 other outlets - shops, pubs, schools, garages etc - around the village. However, after 12 years Peter is now looking to hand over the reins to someone new; to an individual who is willing to support this noble cause and be happy to spend a couple of months a year as Poppy Appeal Organiser right here in Cuckfield. In addition, following the success and publicity generated by the recent ‘Cuckfield Remembers’ activities, the Cuckfield RBL is also seeking new members to join its band of dedicated volunteers. The Cuckfield branch is principally associated with the Remembrance Sunday ceremony at Holy Trinity Church, but a revamped programme of social activities and speakers is being planned. Whilst former serving members of the armed forces are always welcome, a military background is not necessary to become a member. When we think of the hymn We Plough the Fields and Scatter the image that we often conjure up is one of a tractor turning over the soil preparing for harvest. Most of the terrain surrounding Laines Organic Farm right here in Cuckfield is cultivated by hand, not by machinery. Largely by Toos Jeuken, a Dutch farmer who arrived in West Sussex not long after Britain joined the European Union. All joking aside, Toos doesn’t appear to be overly concerned about her passport status. Instead her motivation is clear; to ensure that her crops are protected and well nurtured in time for harvest. Toos arrived in Cuckfield in 1977 - a year after her father bought the farm with the sole aim of using it to grow vegetables.